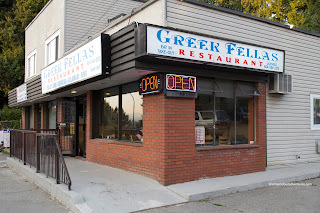 Quite awhile ago, I spied a Greek restaurant on one of the rare occasions I drive along River Road in Delta. I think I was avoiding the Patullo Bridge since there was an accident (as if that doesn't happen ever). I kept it in the back of my mind, but never had a burning desire to eat there. Besides, there isn't a whole lot of literature on the place. But like most restaurants, I'd get to them sooner or later. Finally, it was due to Supreme's insistance that she treat me to dinner that I finally had an opportunity to eat at Greek Fellas. You see, I helped her install some lights on her car (she has the same car as I) and felt the need to treat me to food. And since she lives out in North Delta, it seemed like a good spot to meet. Ip Man and Ninja tagged along, but they were a little confused about our eating destination. I don't blame them... If you Google map the address, you'd wonder why too. 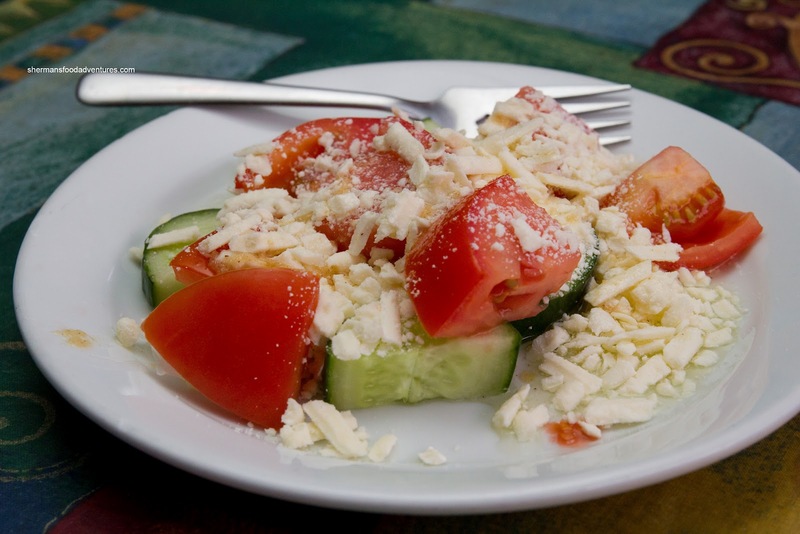 We were presented with some Greek Salad to start. It only consisted of tomato, cucumber and feta which suited me fine because I'm not a huge fan of raw onions and peppers in my salad. It was pretty good being fresh and only lightly dressed with vinegar and olive oil. Next was the Calamari which arrived in a modest portion. 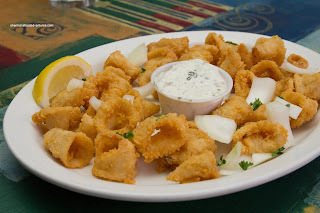 The fried morsels were an attractive golden brown which in turn resulted in a crispy exterior. The breading was not greasy and actually kinda light. The squid itself was tender without being too soft. There was still a bite. Furthermore, it was well-seasoned. The tzatziki was thick and tasty. For myself and Ipman, we had the Roast Lamb. For some reason or another, his portion was larger (which I took a picture of instead of my own). The lamb had a nice roasted flavour and richness. The meat was fall apart tender and moist. There was a good amount of seasoning which as not salty. The lemon potato was a touch stiff, yet still easy to eat. It had a good balance of acidity. The rice was a touch soft, but was not bad. Supreme and Ninja had the Prawn Souvlaki which was quite good. 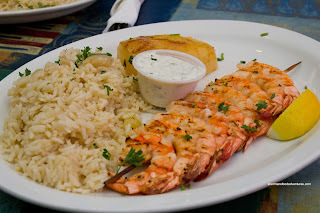 It was grilled nicely where the shrimp retained a sweet snap. Again, it was only a modest portion, considering the price. And that is the one problem I have with the place. The food in general is surprisingly good considering its low-key existance. 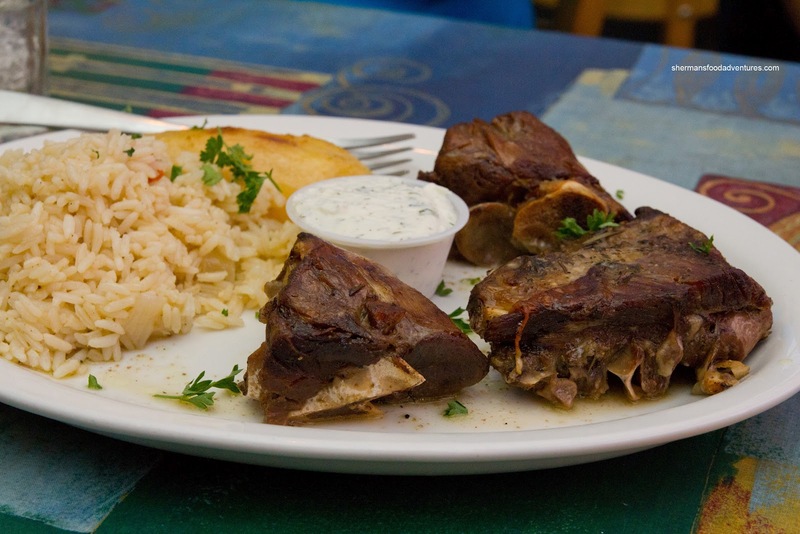 However, at prices that are around $20.00 per entree, it effectively takes itself out of the hidden-gem category.